Musser, A.M. 2006. Furry egg-layers: monotreme relationships and radiations. Pp. 523-550 in Merrick, J.R., Archer, M., Hickey, G.M. & Lee, M.S.Y. (eds.) Evolution and biogeography of Australasian vertebrates. Auscipub, Sydney. 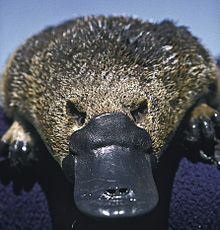 Monotremata in Mammal Species of the World. For more multimedia, look at Monotremata on Wikimedia Commons. This page was last edited on 20 March 2019, at 03:15.